Where do I get ex-battery hens from? The more space the better really, but they need no more or less than 'normal' Hybrid Chickens. The Chicken House should be worked out at one chicken per square foot as minimum. My main Chicken House if 6' x 4' (24 sq.ft), but I would not house more than 12 in there, but I wouldn't keep more than 9. Will there be any squabbling when they arrive? Yes! We often speak about introducing new chickens to old as being a problem, but remember that these new arrivals have not met each other before. 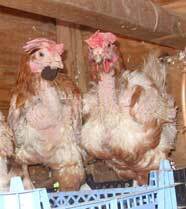 They have been shut in a cage with four other chickens, so expect there to be the normal pecking order ups and downs. This is where the larger the space they have the better. A good area will give them places to keep them occupied rather than hanging around getting bored. They peck each other's feathers out a lot because of this. Read more in 'Introducing new Chickens'. How soon will their feathers grow back? This varies quite a bit, but you'll be surprised at the speed they naturally adapt to their new and natural life. I introduced four new ex-battery Chickens about 7 weeks ago, three have feathered up almost completely, but one is still quite bald. She seems quite healthy, it's just a some and some situation. Do they eat the same as other Chickens? Will they mix with 'hybrid' Chickens OK? Yes, but ex-battery chickens have what I call 'street cred', they're hoodies with feathers on!!! They're used to squabbling over who gets to front of a cage for feed, so you'll probably find the ex-batts could be bullying the Hybrids rather than the other way round. Again, some and some and I've never had any problems. Space is the key - the more they have, the more space they have to do their own thing and keep out of each others way should they have to. Will the cold weather affect them if I get them in Winter? Unless it's absolutely out the norm cold and a Hen does not appear physically unwell, I feel the answer is no. 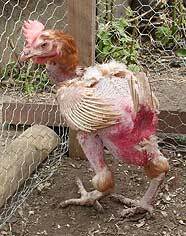 Personally I do not go along with the idea of knitted coats, they can hinder the hens movement and sooner or later you have to take them off and the hen has got used to it. Best for me is to simply make sure the House is well 'cosified' and the Hens will look after themselves. How long do ex-battery hens live? 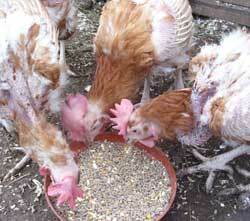 My experience over the years has been that about one in ten Hens do not survive the first six weeks or so. They appear perfectly fine, then overnight they can appear to have just given up. Some cannot take the change from their caged existance to a more natural one. This can anger you, it's not your fault but the result of conditions they've got used to. Please remember though that you gave them the chance to have some of the environment they richly deserve. If all goes well, I've had some who've reached five years old, on average I'd say about four. Where can I get advice and help? The Down the Lane Forum has a big Chicken Keeping Section which is hugely active and full of Members who have kept Chickens for a long time. We go on the 'no question is a silly question' basis and I'm sure you will find reading through the Chicken Categories that it's well worth a visit. The Down the Lane Forum. This little Lassie regained her feathers in about 12 weeks and became Queen of the Pack !